Shots of the items a bride will be wearing down the aisle are always essential, especially considering the time and thought that was put into picking these items out for the big day. I always make sure that the shots of these details somehow incorporate the venue as well, as opposed to taking a shot of the object sitting in a box. Whether its high-end shoes, diamond necklaces, pearl earrings, beautiful bouquets, or any other bridal detail, I make it a priority to make each photo unique to the bride-to-be and capture the setting of the event. The process of detail shots is made much easier when the venue is as architecturally stunning as Graydon Hall Manor in Toronto, Ontario. Not only is the outside of this building visually phenomenal, the inside is tastefully decorated and full of photo opportunities, even for pictures of high heels. 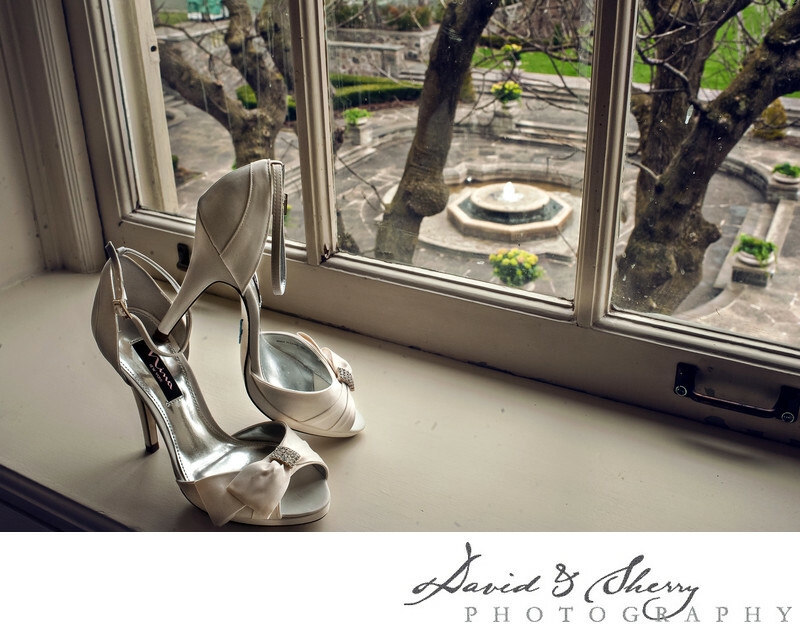 For this image of these fashionable cream-coloured shoes, I wanted to include part of the ceremony location in the background in order to tell a story. The courtyard of Graydon Hall is typically where the outdoor ceremonies are held. The stone steps, greenery, and grand fountain create a timeless and elegant atmosphere for a wedding day.